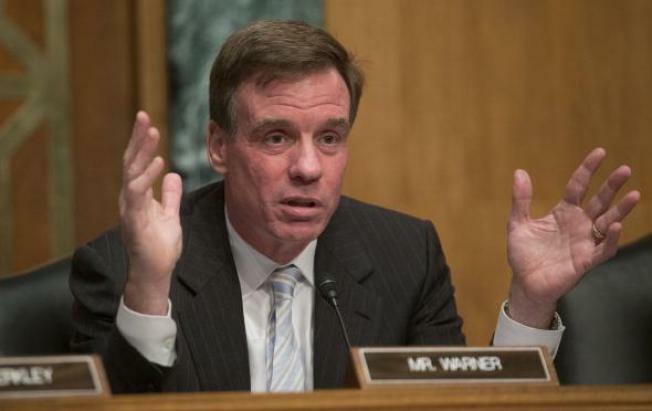 Senator Mark Warner, a Democrat from Virginia and chairman of the Senate Banking Subcommittee on National Security and International Trade and Finance, makes an opening statement during Senate Banking Subcommittee hearing on virtual currency in Washington, D.C., U.S., on Tuesday, Nov. 19, 2013. Bitcoin's rally is accelerating as the U.S. Department of Justice's description of the digital currency as a 'legal means of exchange' bolsters the prospect of wider acceptance as an alternative payment system. U.S. Sen. Mark Warner has nearly $9 million to spend on his re-election campaign, which has yet to begin in earnest, the Democratic senator and former governor's campaign announced Wednesday. Warner raised nearly $2.7 million during the first three months of this year, leaving him with $8.8 million cash on hand, the campaign said. Nearly two thirds of the 11,000 donors during the quarter were Virginians. Republicans have not yet selected a candidate to challenge Warner. The GOP will choose June 7 at a convention in Roanoke. Former Republican National Committee Chairman Ed Gillespie is the favorite to win the GOP nomination battle. He has not yet announced his first quarter fundraising totals. Last month, former Republican presidential candidate Mitt Romney headlined a fundraiser for Gillespie in New York. A recent Quinnipiac University poll showed that Warner had a 15 point lead over a potential matchup against Gillespie. Warner will face a campaign finance landscape that is dramatically different from when he was first elected in 2008. A series of federal court rulings in recent years have weakened limits on political spending and fundraising. Most notably, outside groups like super PACs can raise and spend unlimited amounts in efforts to help their preferred candidates. Americans for Prosperity, an outside group backed by conservative billionaires Charles and David Koch, has already spent millions attacking vulnerable Senate Democrats for supporting the Affordable Care Act. In 2010, Gillespie helped launch a well-funded super PAC -- American Crossroads -- with Republican political strategist Karl Rove. Warner campaign spokesman David Turner said the campaign will be prepared for "any eventuality'' and will have the resources needed "to effectively communicate'' the senator's record.